Sometimes when you want something fancy to wear, you don't have to look any further than your pantry! 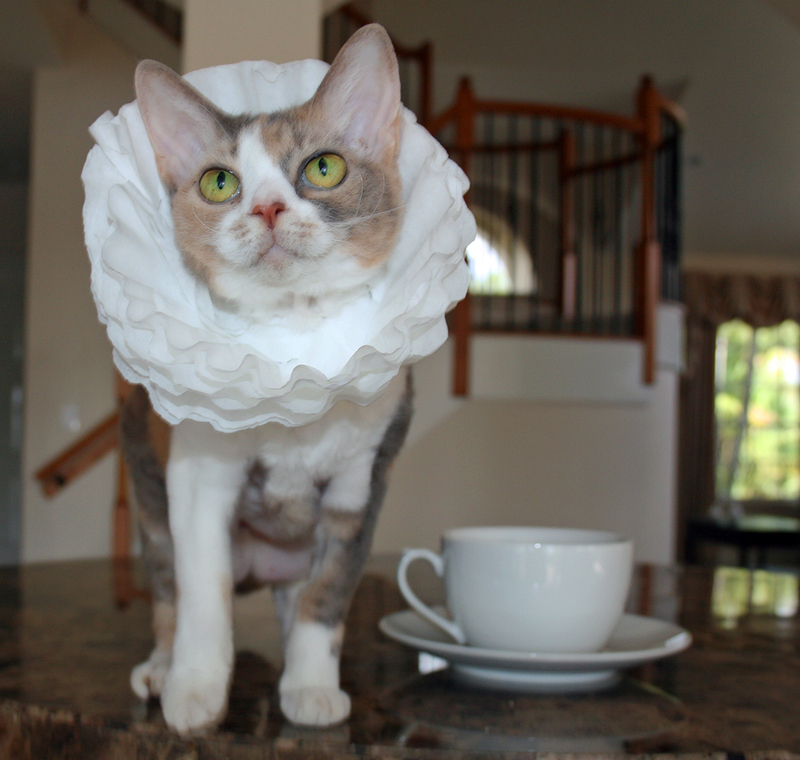 This beautiful Elizabethan collar is made out of coffee filters. How do I look? Absolutely stunning! They look so much better on you than on coffee!!! Looks great! Someone is very creative over there, your mom? You are such an awesome model Miss D.
Daisy, you make anything look good! That sure is an interesting use of filters, Daisy! You can come and serve Mum's coffee anytime. Oh Daisy, that is such a nice collar. Who knew?? ok. that seriously made me snort. Daisy, only YOU could carry that off! BRILLIANT! I bow to Queen Daisy! It is beautiful. WHo knew! Daisy, I have heard that upcycling is the latest things among fashionistas and now I understand why. Princess T.
That is just lovely! Will we get to see an upcycled gown to go with it? WOW!! What a resourceful kitty you are Daisy!! That coffee filter collar is super! Oh how sweet you are Daisy and how clever Mommeh is, love it! You'll have the most original outfit at the party! Only YOU, Daisy, can wear just a coffee filter and look lovely! How cute. 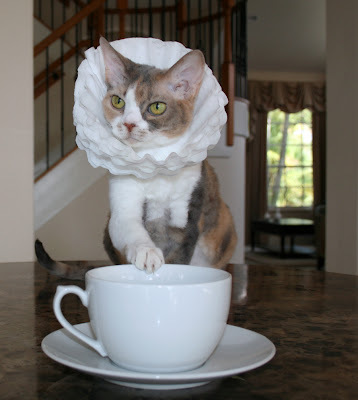 Never thought of a coffee filter collar. Daisy, only you could make coffee filters look good. Allie: oh Daisy, you'd make ANYthing look good! Wait...I think WE have those too...*runs off* Oh MOTHERRRRRRRR....! That is just too cool! Me wonders if My Mommy would makes mes a collar like that!!! Ha! Great idea for a Halloween outfit Daisy!